334 machines came under starter’s orders for the 41st Dakar Rally Monday morning in Peru, with a total of 541 crew members, 137 bikes, 26 quads, 130 cars including 30 Side by Side machines and 41 trucks setting off. 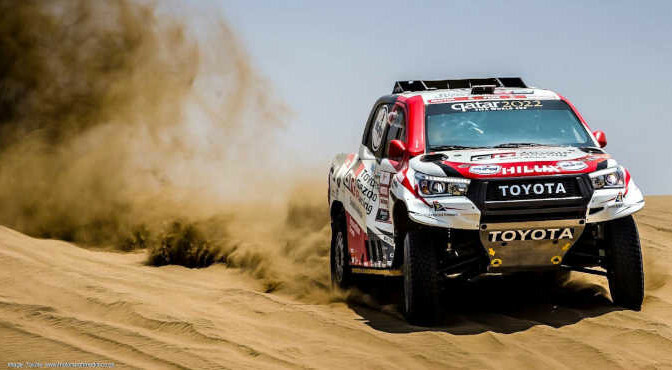 The day started with a 247 km liaison down the spectacular Pacific coast before an 84km loop around the dunes of Pisco and it was Nasser Al Attiyah who served notice of Toyota’s intentions by leading the first day of the car race all the way. The Qatari brought his Proudly South African Gazoo Racing Hilux home a minute and 49 seconds clear of Spain’s Carlos Sainz’ Mini buggy and the Mini 4×4 of day 1 surprise, Pole Jakub Przygonski. Russian Vladimis Vasiliev was another turn-up for the books, provisionally fourth in a privateer Hilux ahead of Yaseen Al Rajhi in another Mini. South African hope Giniel de Villiers drove home a measured sixth in the second SA built Hilux, just ahead of Stephane Peterhansel on his 30th consecutive Dakar start. Bernhard ten Brinke’s third Gazoo Hilux, Harry Hunt’s Peugeot and Cyril Despres in a Mini, closed off the provisional car top ten. South African rookie privateers Shameer Variawa and Zaheer Bodanya were full of nerves as they awaited their start time well back in a very busy 84km stage through the dunes, expecting navigation will a bit easier but concerned to have to do so much overtaking on tracks churned up after all that traffic. None of that proved any worry at all, as former SA Special Vehicles champion stormed through the pack to bring the Red Lined SVR Nissan Navara home a fine 45th on their first Dakar trot. The bikes and quads started before the cars, setting off in reverse order of seeding to leave the top Southern African two-wheeler competitors near the front as old rivals Kenny Gillbert (Husqvarna) and Ross Branch (KTM) shared identical times at Waypoint 2, the rookie pair showing good pace as they initially sat second and third overall with the quicker half the field still to come. When the fastest bikes eventually did arrive, it was Spain’s Joan Barreda Bort who took the day for Honda from Pablo Quintanilla (Husqvarna), US rider Ricky Brabec (Honda), Adrien van Beveren (Yamaha) and the KTMs of Brit Sam Sunderland, Aussie Toby Price and last year’s winner, Austrian rider Matthias Walkner. Gilbert ended 39th for the day, Branch 42nd and SA no-assistance Original class rider Stuart Gregory 84th. Argentine Nicolas Cavigliasso took the opening quad stage with his 4th Dakar stage victory, beating countryman Jeremías González Ferioli by 4 minutes. 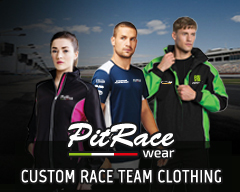 Come back later for an update on that crew’s progress among other late Dakar Day 1 news. Day 2 on Tuesday runs from Pisco to San Juan de Marcona in the first long stage of Dakar, once again through the dunes of the Peruvian desert.